While waiting for the countdown to 2011...thought I'd get one last post in before the official end of the year. 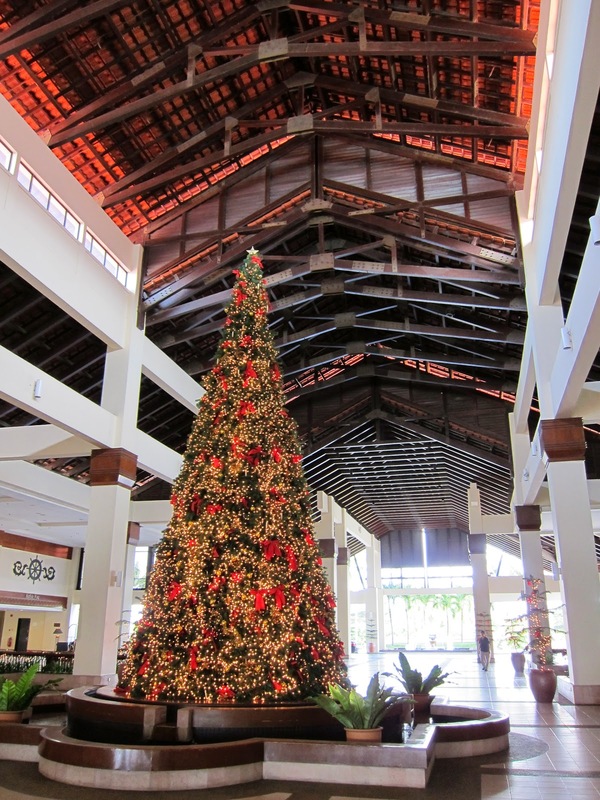 Should probably cover our Christmas dinner at Ferdinand's in Sabah, while on family vacation, before too much time has passed! Ferdinand's is a world class restaurant (listed as one of the best restaurants in Malaysia by the local Tatler magazine) serving up Italian fare in the only fine dining venue in The Magellan Sutera Harbour Resort, and the care they took with their holiday dinner really showed. 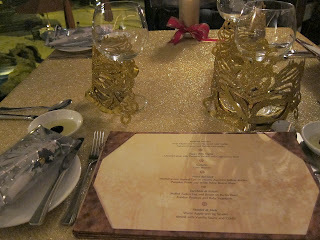 The tables were gorgeous, with a sparkling gold mesh over their linens, celebratory items at each seat including an elaborate, sparkling gold mask and beautifully packaged noisemakers and 'champagne bottle confetti' (ok so these are more appropriate to New Year's Eve, but they were gorgeous nonetheless) and gold pillar candle casting a soft glow over the whole setup. The windows overlook the South China Sea, and the pool, lit up to a beautiful blue at night, as well as the lovely candle-lit tables on the patio of Al Fresco. In other words, fantastic ambience inside and out. 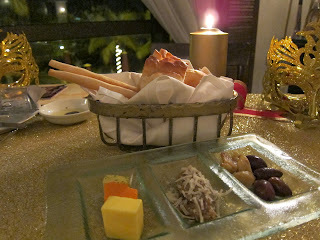 We were immediately greeted with a basket of warm rolls and breadsticks once we were seated, along with a plate consisting of a trio of butters (loved the tomato butter, along with the herb and unsalted), eggplant tapenade topped with shredded cheese, and olives. In a celebratory mood - my dad wanted to order champagne, but all were offered by the bottle - and since none of us were big drinkers (nor interested in getting sloshed with family!) we ended up with some prosecco, the only sparkly we could order by the glass. As for food, it was a four-course prix fixe menu with two options for entrees - all courses were amazing and completely exceeded expectations. Our starter 'Antipasti Nataliza' was Wild Mushroom Terrine flavoured with Truffle, and a Tomato Mousse and Buffalo Mozzarella. We appreciated that the plating, like the table settings, exhibited skill and care in presentation - though the mozzarella was a little too watery and my 'tower' toppled over on its own before I could get to it. 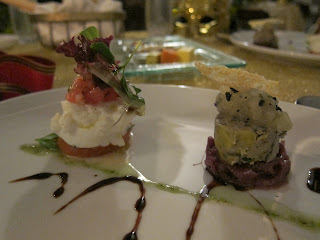 I did enjoy the terrine with its fragrant truffle flavors. 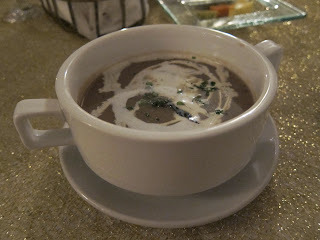 Next up was a 'Zuppa della Vigilia' - Chestnut soup with Pumpkin Ravioli and Cappuccino Foam. I thought this was a great, inspired way to incorporate a holiday staple - chestnuts - into the menu. The soup was creamy and especially soothing on that rainy night. Before our entrees, Sorbetto - Lime Sherbet - arrived for us to cleanse our palates, served in an adorable little ceraminc dish. As seafood lovers, for our entree both my mom and I ordered the 'Pesce del Nord' - Mediterrenean crusted Cod on creamy Zucchini Saffron Risotto, Pumpkin Puree and White Wine Beurre Blanc. The fish was incredibly fresh (as a matter of course, we were in Sabah!) 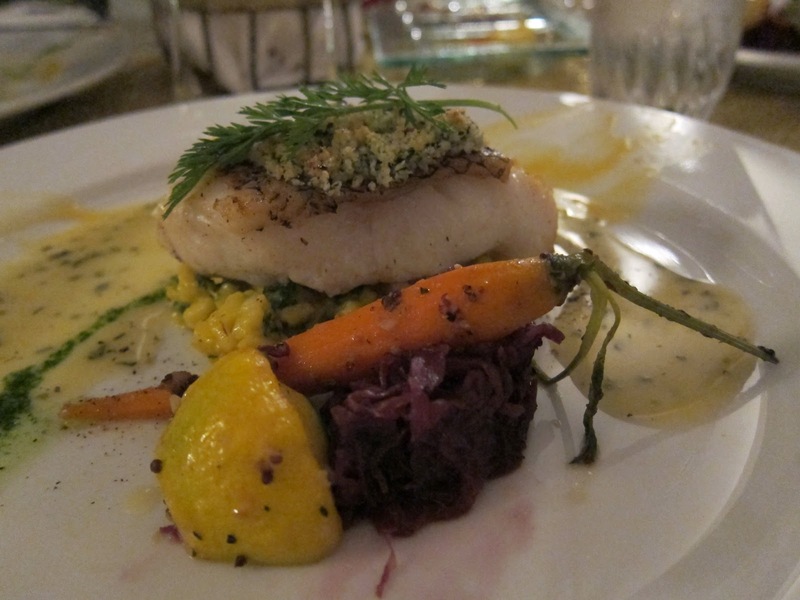 and well balanced with the creamy risotto and crunchy veggies on the plate. My dad had the 'Taccino di Natale' - Stuffed Turkey Leg and Breast on Barley Pearl, Fondue Potatoes and Baby Vegetable. We thought this was a creative way to serve up another holiday staple, at least visually - and my dad enjoyed the dish, noting that the turkey was perfectly juicy and well-flavored. 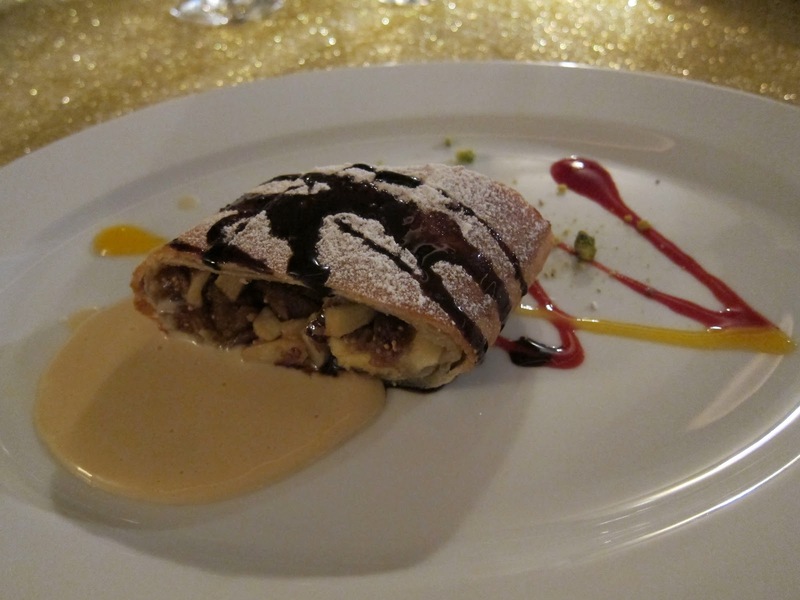 As for dessert - we had 'Strudel di Mele' - Warm Apple and Fig Strudel served with Vanilla Sauce and Coulis, which arrived at just the right temperature to release the well-balanced sweet/tart fruit flavors, with the pastry shell at perfect thickness and flakiness. After the great meal, the staff lined up at the door on our way out to give us a personal thank you (way to make us feel like VIPs - thanks Ferdinand's!) and to give us a little parting / holiday gift - we each got a small box filled with chocolate / prune themed treats (not sure what the connection was of prunes with Sabah, but the treats looked tasty)! There was a chocolate macaron (made the Parisian way, with a crispy shell and light, airy but tender interior - no coconut) filled with a prune flavored cream, a sugared prune 'sandwich' with prune filling, and a seashell-shaped chocolate cookie and prune filling and a sprinkle of crushed pistachios on top as if to represent sand on the shell. A sweet reminder of the great experience we had at the restaurant! 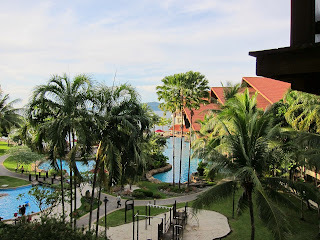 Overall, loved Ferdinand's and would definitely return next time we stay at the Sutera Harbour. It was an insane deal for fine dining at Christmas, at a total of RM556 for three people including 3 glasses of Prosecco! (Translates to approximately $1300 HKD or under $170 USD TOTAL!!!) Though in Sabah, you would ideally want to taste local flavors and specialty dishes (see my post on Ocean Seafood Village and other local eats / adventures) Ferdinand's is a great choice for those who want to stay within the resort hotel, or just want a fine dining option with western offerings on special occasions like Christmas (as my parents did that particular night). This holiday, my parents decided they wanted to vacation in Sabah, Borneo, and were nice enough to ask me to come with them as a 'stop' on the way to visit in Hong Kong for Christmas! 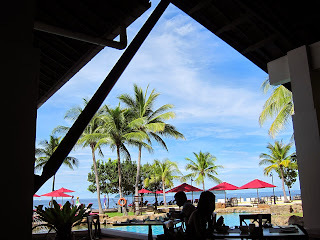 After a 14 hour flight and layover, we flew out together to Sabah to stay at the Sutera Harbour Resort, conveniently located just 10-15 minutes from the airport and a short ride from Kota Kinabalu's city center. The giant complex, comprised of two resort hotels, a golf course, marina and country club, still managed to give off the vibe of a remote island retreat with gorgeous views of the South China sea and tropical islands of the Tunku Abdul Rahman Marine Park, airy accommodations with architecture inspired by aboriginal culture (e.g. longhouses), a huge boardwalk lined with sunchairs and hammocks sandwiched between the ocean and free form pools with a swim-up bar - all the better to enjoy the beautiful 85-90 degree weather Sabah provided in the depths of December. 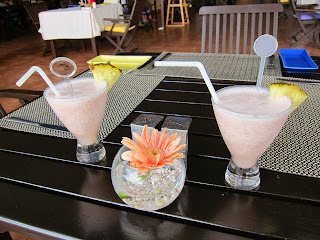 While waiting for check-in, we were offered a 'welcome drink' at Tarik's Lobby Lounge off the far side of the registration area. 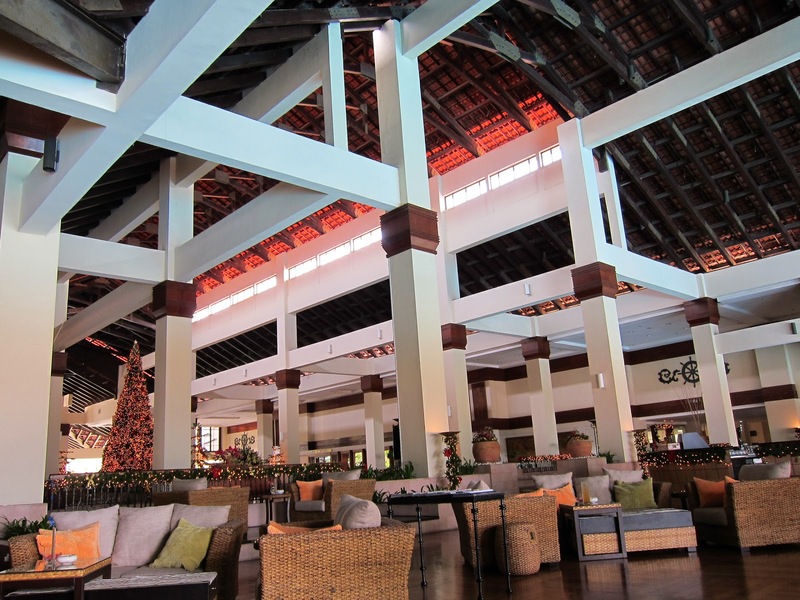 I loved this space, which very skillfully mixed Borneo heritage with western sensibilities - with lofty longhouse inspired ceilings with exposed wooden beams, and colonial style ceiling fans - while taking full advantage of the fresh ocean breezes and fresh air with wide open sides (no windows!) not only all around the building, but with the far side of the lounge dropping off into unobstructed views of the pool and ocean below. This casual dining space can be found pool-side on the lower-level of the lodge, to the left of the spa if you're facing the ocean (I love saying the latter half of that sentence!). Al Fresco serves up food and drinks all day, and we were a fan of popping down for quick bites between meals. but with occasional, though not critical, drawbacks). I asked if I could have the 'welcome drink' (aka crack) - which they readily provided. Pictured in the background is the pizza counter, where wood-fired pizzas are made from scratch in the small open kitchen. Enticing as the smell of fresh pizza dough was, I could not bear to fill up on carbs when I was at one of the top locations for some of the freshest seafood in the world. My mom agrees (we have pretty much the same taste, which makes eating out together easy and fun! 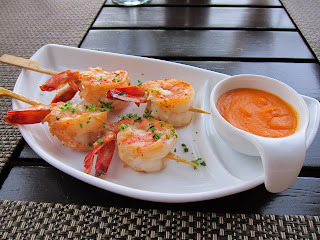 I think I inherited my love of / sense of adventure when it comes to food from her) - and ordered the shrimp skewers with Romesco sauce. 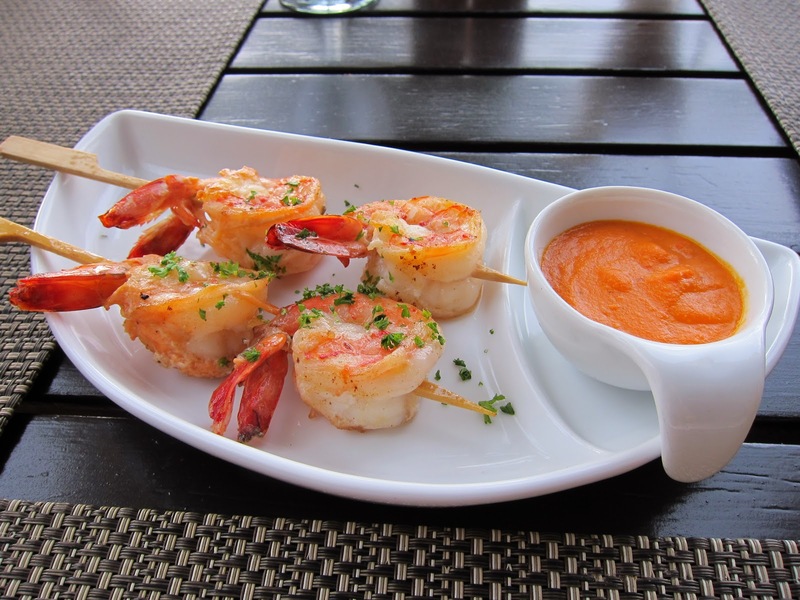 The shrimp was plump, juicy and sweet -and perfectly grilled to a crisp outside, and tender inside. Also key: it was hot off the grill. We hadn't tasted shrimp this fresh since...maybe Tsukiji! Loved this dish. My dad is usually a steak and eggs / potatoes kind of guy, but can 'tolerate' seafood of particular kinds in small doses (!!!!) 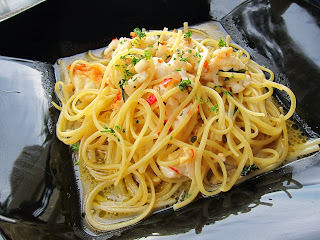 So he ordered the Linguini Aragosta. He was happy to report that the lobster was also juicy, sweet and fresh. 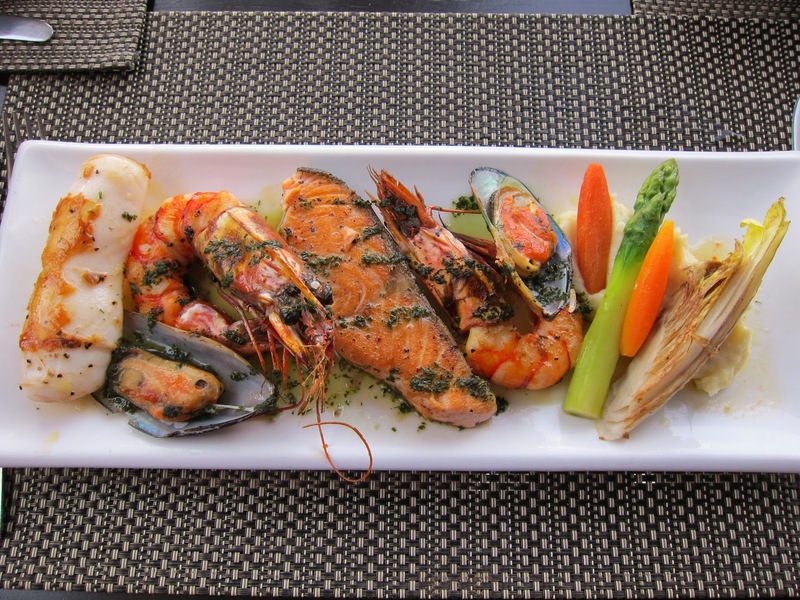 I decided on the Seafood Combination - a small sampler platter of the fruits of the sea: squid, shrimp, mussels, and salmon fillet accompanied by veggies, all lightly grilled. In one word: amazing. Everything tasted so fresh, and like the shrimp, was perfectly grilled. seafood arrived (they bizarrely left us alone when we had the sweet fruity drinks on the table). So my only complaints about dining at Al Fresco, is the pests you have to compete with and race against to eat your food - which of course is a hazard for any meal done...well...al fresco. It was just a little less idyllic and became stressful to have to use one hand to swat the gnats away while trying to eat with the other. But it was starting to rain/drizzle during that meal, so my dad thought that brought the pests towards our table 'indoors'. 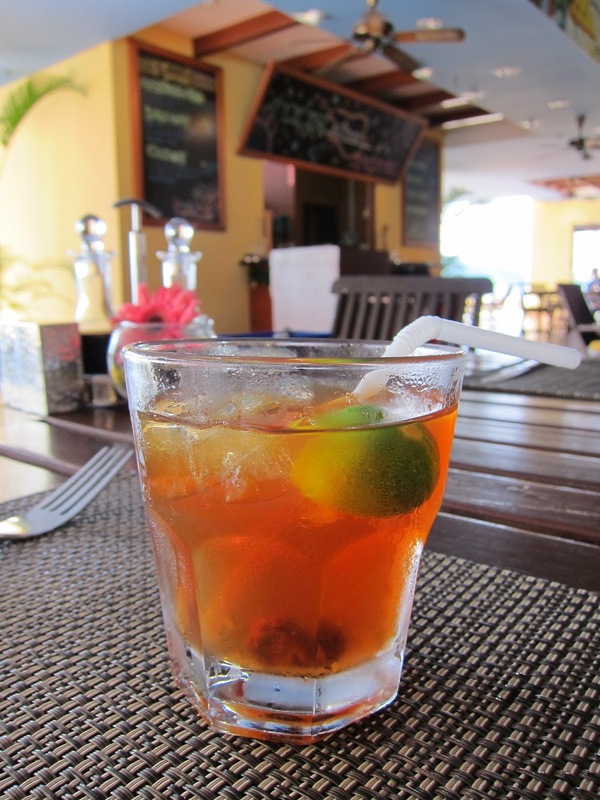 Also, service while very friendly is at 'leisure' speed - it took 25 minutes between arrival of our drinks and food. That said, we were at a resort and knew we were supposed to move at a slower pace - so we tried to keep our three Type A personalities at bay from rearing their unwelcome heads while on holiday. 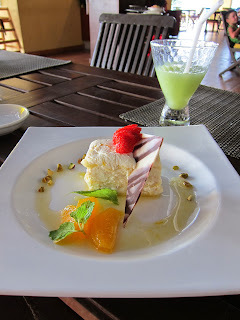 Otherwise, the setting was beautiful and convenient, the food was great and prices reasonable - so I would recommend this as a dining option within the resort or for guests staying elsewhere in the immediate area...ideally while it's sunny out. 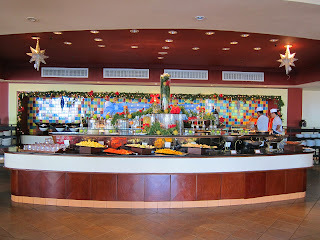 As part of the package deal my family purchased, breakfast each day was included at the resort - we only needed to show up at Five Sails with our meal vouchers to be admitted to the buffet, which runs 6:30am-11:00am each day. 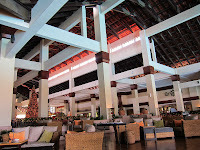 Five Sails is in the lower level of the main lodge at The Magellan hotel, and offers both indoor and outdoor seating. Outdoor seats give a great view of the pool, and where blue sky meets blue ocean beyond. Indoor seats are in a glass enclosed area that makes it feel like any other restaurant, and is not recommended for that reason. The food offerings at the breakfast buffet are extensive, and reflective of the diverse cultures that thrive in Malaysia - Malaysian of course (lots of interesting local dishes from mee hong noodles to curries and meat stews), Chinese (congee, dim sum, bao etc. ), Indian (naan, curries), and of course western (scrambled eggs, made to order eggs and omelettes, pastries, cereal). 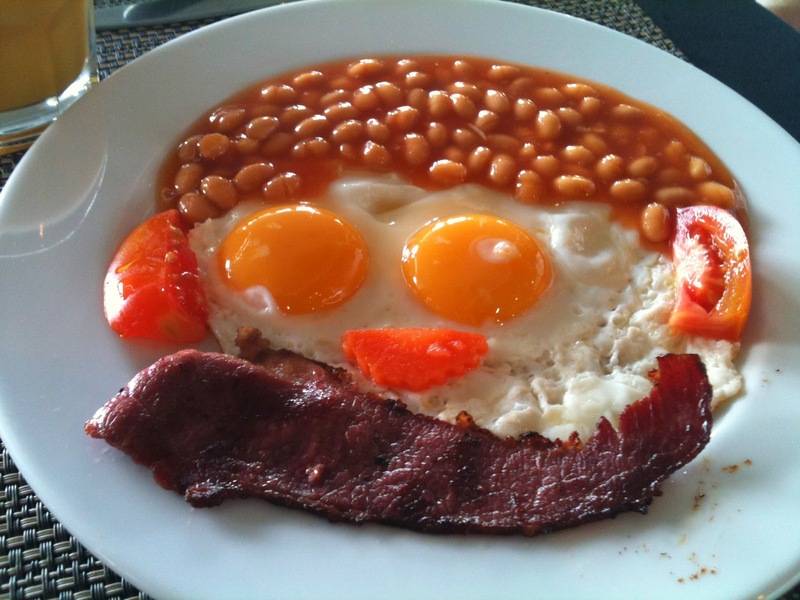 Pork was notably missing, as Malaysia is a Muslim country - and the resort has come up with creative alternatives for breakfast staples like beef bacon and chicken sausage. My dad got creative with his breakfast items (pictured at left). 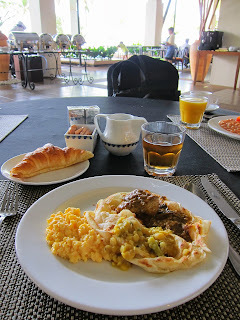 My favorites - that also turned out to be my go-to items every day (and I don't usually like routine when it comes to food) were the soft scrambled eggs, naan with fish/beef curry and vegetable dhal curry, and fresh-baked croissants. The fluffy / fresh off the grill naan was made at an outdoor grilling station - with a chef on one side making eggs and omelettes to order, and a second chef on the other making naan to order. It's not clay-oven made, but hey, it's a 'free' (ok, pre-paid - free for me via the fam) AYCE breakfast with ocean views - everything in context! 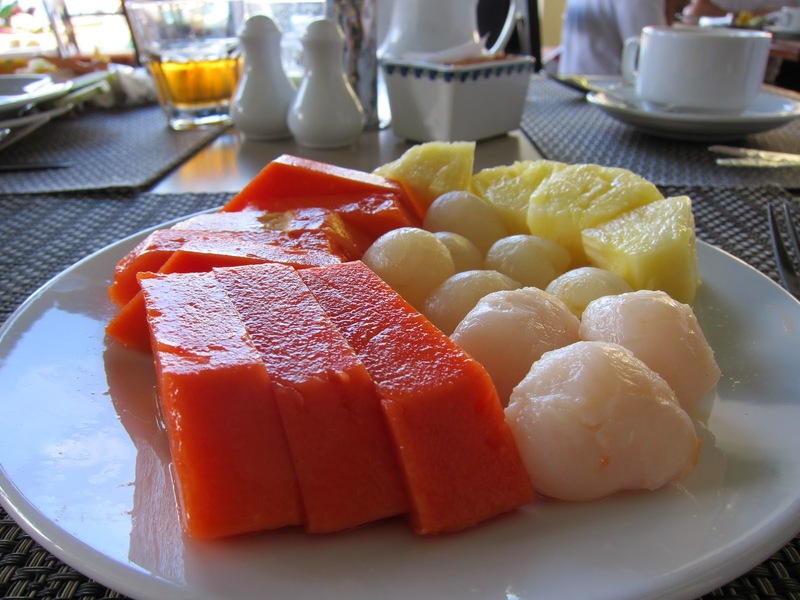 There was also a huge spread of fruit, and I helped myself to way too much (if there is such a thing) - usually a 'best of the tropics' selection consisting of papaya (perfecty ripe, just the right firmness and sweetness), pineapple, longan (orbs in middle of plate pictured at left, sort of like lycees - like Asian cherries but semi-transparent and sweet), and lycees (orbs in foreground, right of plate pictured). The lycees unfortunately tasted like they were from a can (my mom thought they needed to them to represent a key local produce, but as it is out of season in December, they must have just decided to serve it out of a can rather than omit it from the buffet). Another item that became a favorite was something that I tried without having any idea what it was besides being some kind of beef dish (see the enormously informative label pictured at left - I love discovering local dishes, but "Daging Deng Deng" was not exactly helpful for tourists, which formed the majority if not all of the diners at Five Sails)! I Googled it and learned that it's a beef sambal, or spicy chili stir-fried beef. 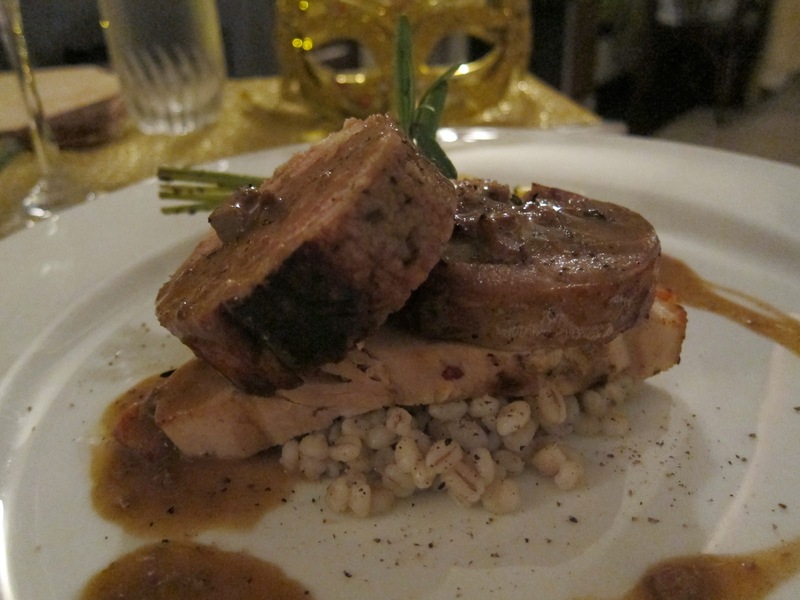 Loved this rich, flavorful dish over coconut rice! 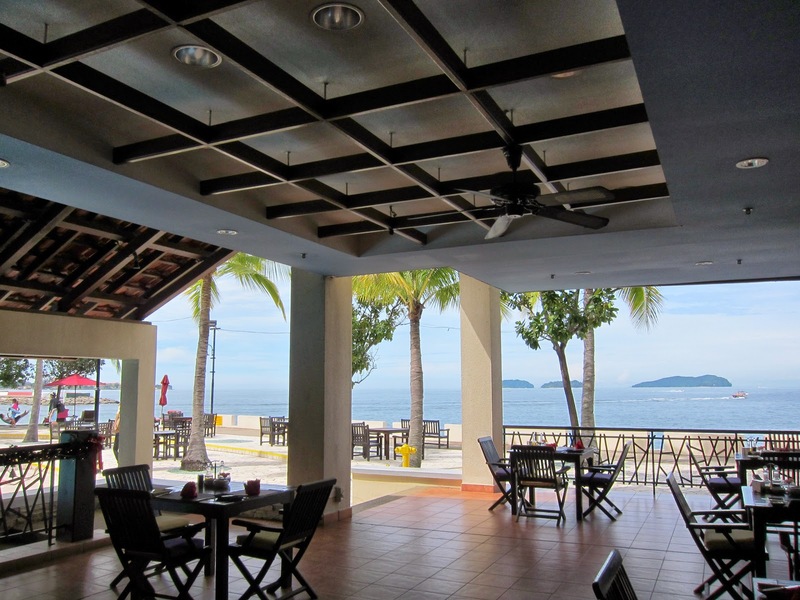 Overall, breakfast at Five Sails is not bad as a cheap part of a package deal with the hotel. 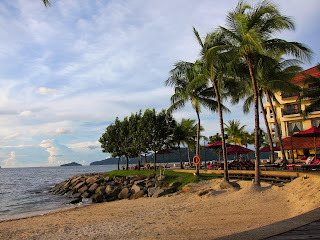 However, if you are a morning person, and inclined to venture out from the resort early - I'm sure there are lots of local discoveries to be had at venues in KK city center. 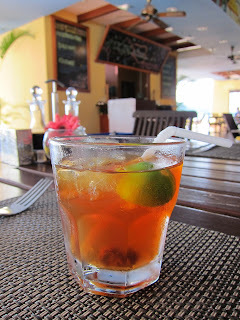 For us, we happened to want to save those for meals later in the day and went to Five Sails as a matter of convenience. 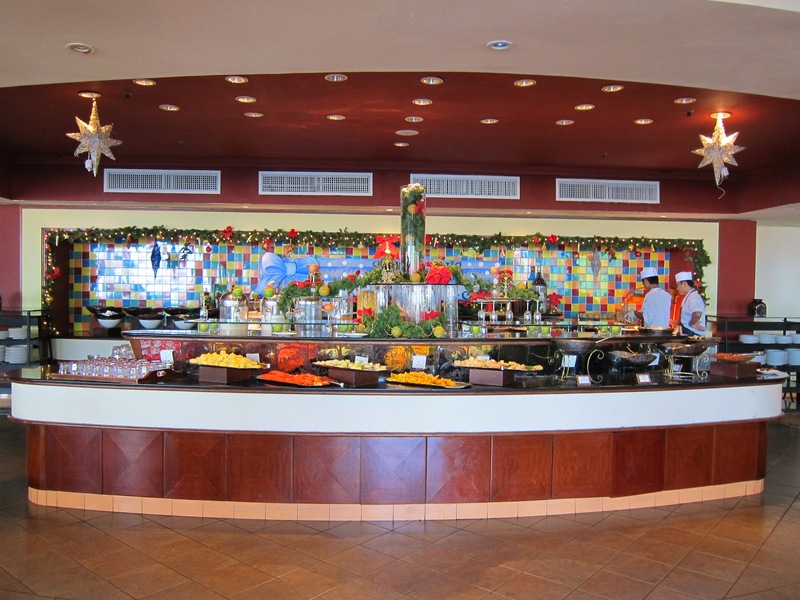 Apparently Five Sails also serves a dinner buffet - we got to experience this on our last night (one dinner buffet is included free with the package). Dinner involves - in addition to the spread of fruits we got at breakfast - roast beef (dry), more seafood (shrimp sambal is only thing of note, and not fresh tasting), soups (beef short rib soup - not done the local way, tomato-based more like a minestrone, and winter melon soup) and desserts (mango pudding so hard you almost had to use a knife, chocolate souffle with consistency of a brownie, various bland cakes - the only highlights were pandan coconut creme caramel pudding which was very tasty, and the ice cream bar with local flavors like yam and sweet corn). There is also live entertainment in the form of a 3-piece band with an island sound, who will come to each table for your song request. 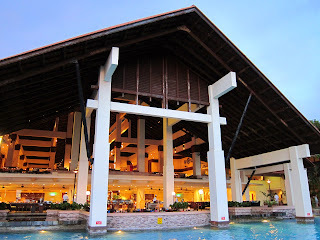 Our verdict: we would never want to pay for this dinner buffet - the quality and selection was incredibly poor for a 5-star resort; we speculated that probably everyone else there were also eating for 'free' with their package. 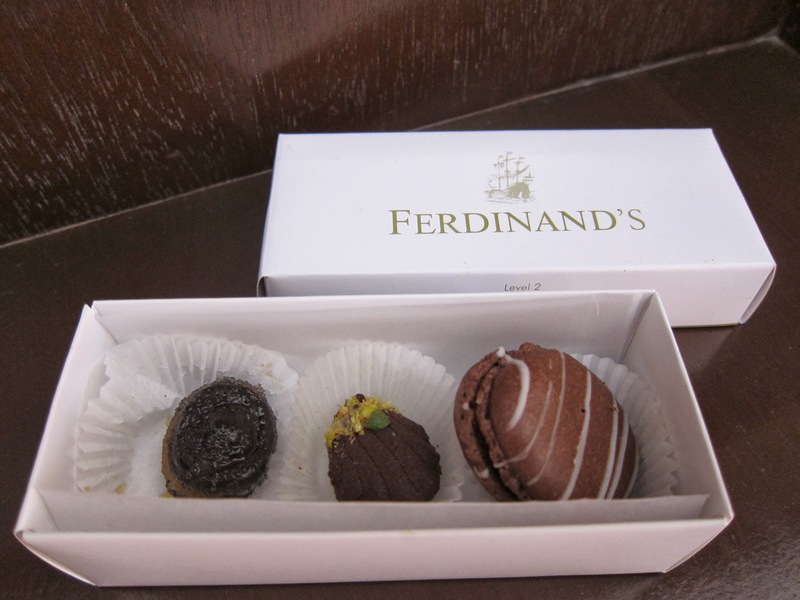 According to the resort, Ferdinand's is listed as one of Malaysia's best restaurants by a local society magazine. It is the only fine dining spot in the resort, serving Italian cuisine. We had a fantastic Christmas dinner at Ferdinand's, which merits its own post - check it out here! 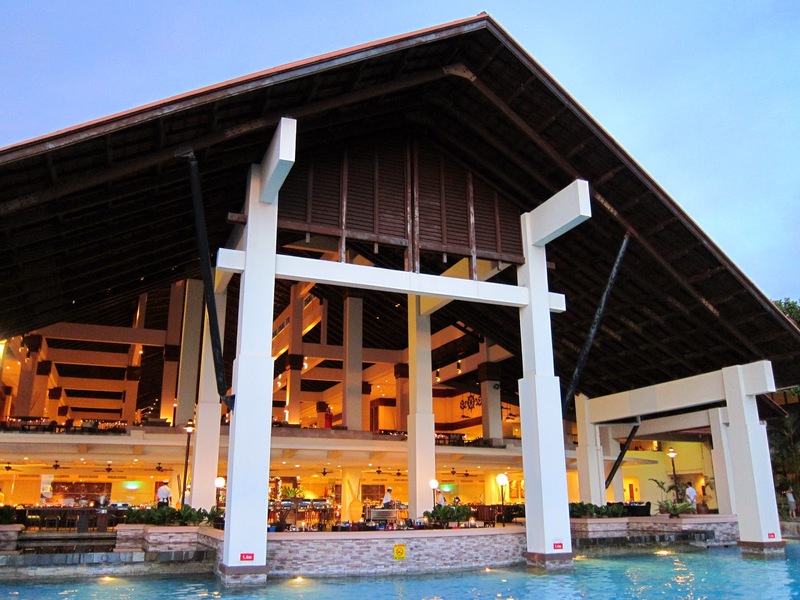 After an all day excursion to Kota Kinabalu for spa treatments (I know, life is rough), and boat tour of Garama Wetland to see Proboscis Monkeys and Fireflies - we were exhausted and ended up at Cafe Boleh (open 24 hours) in the Pacific Sutera wing of the resort for a quick dinner. 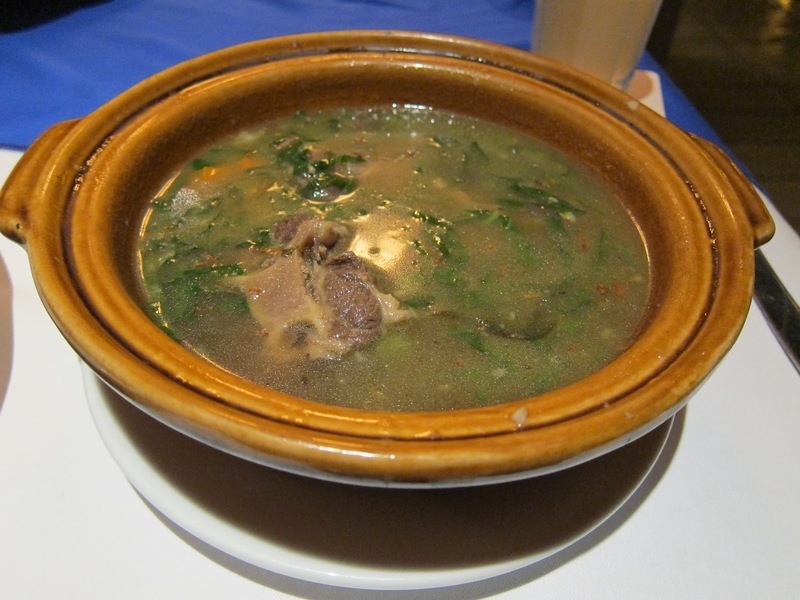 Earlier in the day at the wetlands, we were served a variety of local dishes in a picnic style area - one of the items was a beef short rib soup that was so aromatic I wanted more of it that same night when I got back. Luckily, Cafe Boleh had this on the menu. It was not exactly the same, but still had that great lemongrass flavor that reminds me of pho, but is a little more hearty with big chunks of short rib and vegetables. The portion size was big enough to serve three people! It did get a little too oily near the end so I couldn't finish, but it was delicious. 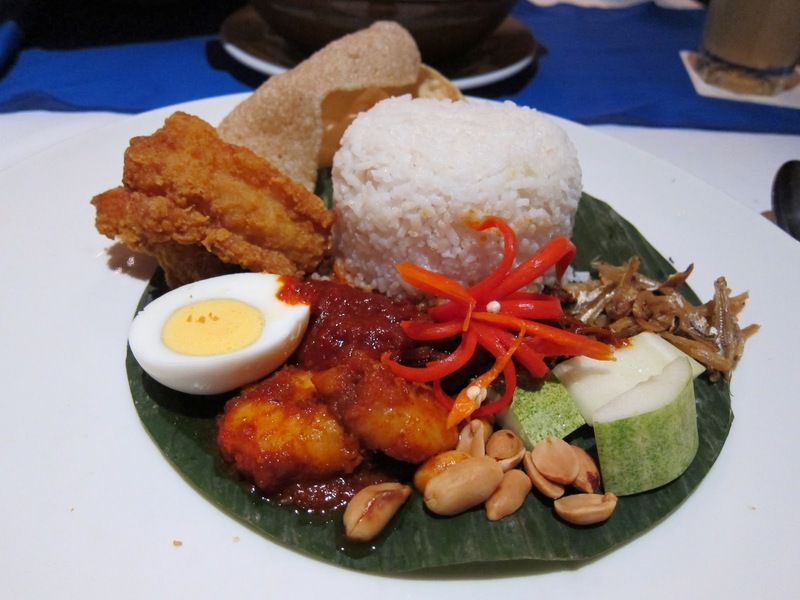 Spotting Nasi Lemak, a Malaysian specialty, on the menu - I had to give that a try, knowing that it probably won't be super authentic and flavorful in a hotel cafe. It turned out to be fairly decent - and interesting platter of fried fish, hard-boiled egg, shrimp sembal, dried anchovies, cucumber and peanuts. I think the idea is to mix everything together with the coconut rice - bibimbap-style (again the servers aren't very informative overall, and mixed up my dad's order). But, I can't quite get used to having big crunchy pieces of peanut and cucumber mixed in with my rice. 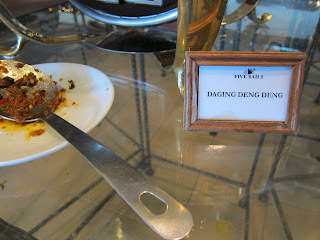 And unfortunately the shrimp sambal was single note in taste - salty. I would give Nasi Lemak another try the next time I go back, definitely at a local joint in town, but did not have a great experience with it at the hotel cafe. As the Cafe was completely enclosed and did not take advantage of the location and setting like its counterparts at The Magellan, and the decor reminded me of an old school Vegas casino buffet, I would most likely not be returning to this location. Overall, it was an amazing vacation in an incredible city at a great resort - Ferdinand's was the best of the dining options at the resort, with Al Fresco not far behind on a sunny, pest-free day. Hope this will be helpful to anyone looking for a place to stay / dine in Sabah! Happy Holidays - Selamat Hari Krismas! 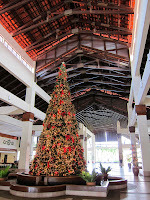 Happy Holidays from Sabah, Borneo! ...with all things merry and bright! And looking forward to a new year filled with fun new adventures and discoveries - culinary and otherwise! After the transcendent Thanksgiving brunch at L’Ermitage this year, when I received the invite to check out an AYCE of another sort at another boutique hotel in the Viceroy family, I was beyond excited. This one is at Oliverio in the Avalon Hotel, and is a decadent experience dedicated to unlimited amounts of one of the most important – as far as I’m concerned - basic food groups…chocolate. Choco-Sutra is a premium chocolate buffet that promised all kinds of confections to tantalize the palate – from classic Chocolate Dipped Fruits, to White Chocolate Panna Cotta, to such original creations as Chocolate Ganache with Mint and Wasabi, and Triple Chocolate Truffle Pizzettas. As a unapologetic chocoholic, I considered it my duty to pay pilgrimage to Oliverio (and the fact that it would be a free was definitely a bonus!). The feast normally runs $28 per person (reduced to $17 pp with dinner at Oliverio), or $50 per couple. I grabbed ‘Lindyhopper’, my go-to fellow chocolate addict, to check the place out in its second weekend after launch. ﻿﻿ The Avalon Hotel is another reclusive boutique hotel in Beverly Hills that most people have probably passed by a million times and never knew was there. Tucked away on Olympic just past Beverly, the hotel sort of gives off the vibe of a 50s/60s vintage apartment complex, converted. The Oliverio restaurant is just to the side of the lobby – on a regular SoCal day, Choco-Sutra would have been served on tables set up at the chic, modern looking poolside. But as we had nearly record breaking amounts of rain the day of our visit – we were seated inside, and our waiter was to bring the food to us, however much we wanted of whatever we wanted. ﻿ I knew we were off to a good start when a beautiful White Chocolate Martini swirled with chocolate syrup arrived to kick off the evening. Then, to give us a sampling of all that’s on offer – we were provided first with a plate that’s a ‘Noah’s Ark’ of sorts, presenting two of every kind of bite-sized confection available. It was a lovely plate, and pastry chef Monica came to our table to introduce each piece. There were a variety of flavor profiles – from sweet/tart chocolate dipped fruits, to sweet/nutty hazelnut chocolate cream mini-tartlets and chocolate enrobed nuts, to sweet/spicy chocolate dipped Serrano peppers and chocolate ganache with mint and wasabi. There were also bite-sized takes on classics like chocolate brownies, baby chocolate cupcakes (with raspberry frosting), chocolate-banana bread pudding, malted milk chocolate balls, and chocolate dipped marshmallows. 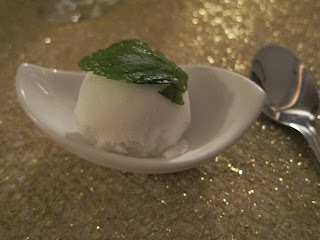 My favorites from this plate were the Bailey’s balls, chocolate ganache with mint and wasabi (though I would have liked the mint and wasabi flavors to come through in a bolder way – with such a creative combination of ingredients, I would have liked to see the innovative flavor come through unabashedly. As is, the mint and wasabi were nearly undetectable – but I still say this piece was one of the best-of-plate, because of the more refined consistency and rich flavor of the chocolate ganache itself, and presentation of the piece) and the chocolate dipped Serrano peppers (which took some getting used to, and was too spicy for me at first - but that I came to love because of the cool sweet/hot combo). Though in hindsight, I should have been more strategic in planning the progression of our ‘meal’ – moving from lighter treats to those that are stronger in flavor (especially the spicy pieces) in order not to have the latter overwhelm or reduce my ability to truly taste the former – for example, I might have loved the hazelnut chocolate mini-tartlet (one of Lindyhopper’s favs) if I had tasted it before the chocolate dipped Serrano peppers. The classic pieces were good, but did not impress with any innovation in design or exceed expectations in execution. 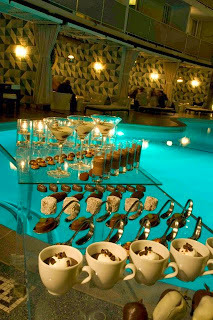 ﻿We also received with that first delivery, a White Chocolate Amaretto Panna Cotta with chocolate biscuit sticks in a martini glass, a South-of-the-Border Chocolate Pot de Crème, and a cute little White Hot Chocolate served in a tiny ceramic cup. All three were amazing – the White Chocolate Amaretto Panna Cotta was smooth, creamy with skillfully controlled flavor, while the Pot de Crème was rich in chocolate taste with red chilis adding a little kick to finish. The White Hot Chocolate was one of Lindyhopper’s favorites – rich, whipped into a foamy consistency, and tasting (to me at least) of almond layered with the white chocolate. ﻿We were already feeling a little stuffed at that point, when we were presented with the highly anticipated piece de resistance: Triple Chocolate Truffle Pizzetta on a huge oak stand. This turned out to be an individual sized pizza, with real pizza dough topped by Nutella, dark and milk chocolate, then nuggets of white chocolate…what we didn’t expect was that it would also be topped by truffles of the fungal variety. In theory, this was a dream piece offering many of my favorite ingredients in the world, and several of the things I would want in my last bite on earth. The truffles were gorgeous, shaved beautifully thin, and provided in very, very generous portions on the pizzetta. And the piece was a clever play in concept with truffle on truffle. However, in practice, the disparate elements in my opinion were missing the thread that would hold it all together: though savory and sweet have been proven in some cases to complement and enhance each other in chocolate confections (e.g. sea salt caramel chocolates), in this case the aromatic mushroom truffles clashed with their chocolate counterparts, and the salty, fluffy pizza dough did not pleasantly cut through the chocolate flavors, but became overwhelming when combined with the gunky chocolate spread. I wanted desperately to hail this pizzetta as a triumph in culinary innovation – and the piece that would on its own justify the cost of Choco-Sutra, but unfortunately it just did not work for these two diners. This dish might have been better served if it were first deconstructed, then put together with only the basics that define a pizza – toppings on baked dough – I could imagine it possibly working well with a thin, crispy pretzel crust, thinner layer of chocolate spread, and a barely detectable sprinkle of truffle salt (instead of large ‘slices’ of actual truffle mushrooms). ﻿ We finished off with a small plate of Nutella filled, sugar coated donut holes, which were fairly delicious, and one more round of White Hot Chocolate for Lindyhopper before we called it a night. The experience was good, celebrating love for chocolate - but Lindyhopper raised a great point which is that a key item was missing – some sort of mousse creation. It would have also been nice to have another chocolate tart item (besides the mini hazelnut chocolate tartlet) and a token sculptural piece for visual interest. Which led to the minor notes from these two diners – to look at the offerings as a curated collection, each piece as part of a whole chocolate themed experience – to select items that hit key textures and visual presentation points as well as flavors. Also, given that even seasoned chocoholics like us can only eat so much at one sitting, quality of the pieces should be balanced with quantity. I may have been ‘ruined’ by the dessert buffet at the L’Ermitage Thanksgiving buffet ($80 per person inclusive of brunch with caviar and raw seafood bar), and had set my expectations for Oliverio to that high level – but at $17 per person with dinner, Choco-Sutra is a deal for the White Chocolate Martini and White Hot Chocolate alone (knowing that martinis can run $12-$15 at comparable bars). Another great thing I should mention about the Oliverio is that valet parking is complementary for restaurant diners, practically unheard of for Beverly Hills hotels like the SLS that charge $12 for valet. Also, reservations made and fulfilled are eligible for OpenTable points. All in all, Choco-Sutra is a great concept and I hope that as the menu evolves that it will be very successful – and a concept that I hope catches on in LA. There's nothing like a hot grill with sizzling cuts of meats - served indoors on a cold, rainy day like we've been having with freakish frequency lately. In particular, I love a great Korean BBQ - and of the tens of dozens of BBQ restaurants in Koreatown, Dong Il Jang is possibly the best of them - for the uber traditional dining experience as well as the specialty dishes (like kimchi fried rice cooked on the grill at your table). Though the outside of the restaurant is non-descript, from the moment you step into the place, you feel transported into another time and space. The decor is an amalgamation of traditional Korean and traditional Japanese mixed with a 70s feel- with an eclectic mix of faux leather diner style booths and waitress uniforms, antiques from both cultures on display, and a tatami room complete with shoji doors for private dining towards the back. 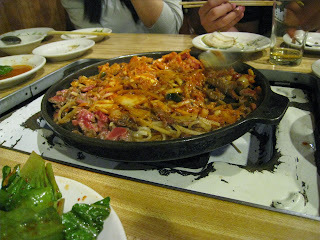 For the most part, dishes at Dong Il Jang are pretty much served family style - unless you get the rice (e.g. bibimbap) or noodle bowls, or the slightly out of context Japanese offerings. After kicking off our meal with complementary bowls of delicious broth, we started in on our order of Pa Jun - seafood pancake made with egg, dough, green onions, calamari and jalapenos adding a nice kick. Delish, though it contained just a little too much dough. 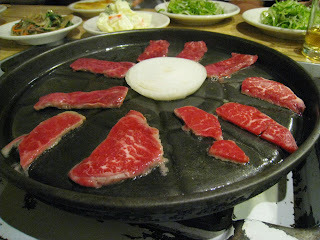 For our meats, we ordered Dong Il Jang's signature Roast Gui - gorgeously marbled slices of prime rib (minimum two orders per table) - which is the only dish on the menu that includes Kimchi Fried Rice, to be prepared at your table after you are done with grilling the meats (more on the rice dish shortly!). We also ordered pre-marinated Kalbi (beef short ribs). Of course, the meats came with an array of side dishes. 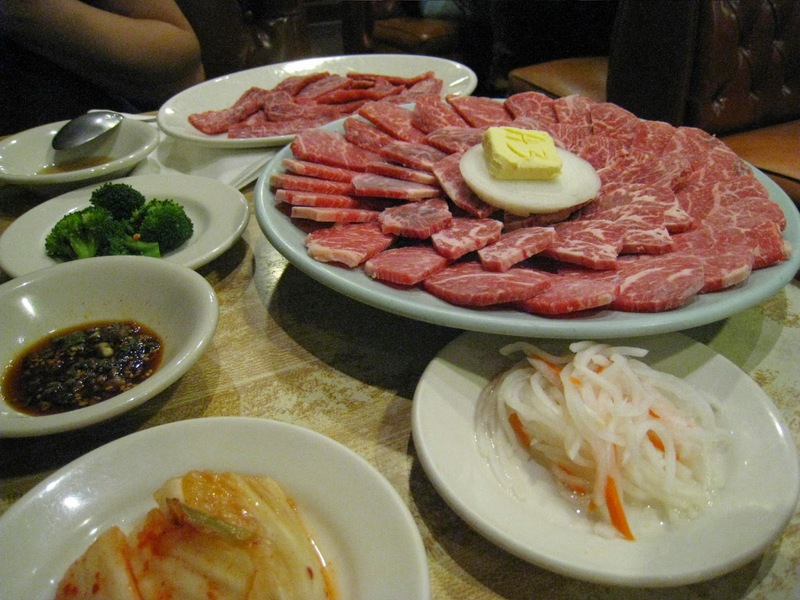 Side dishes are a critical part of any Korean bbq meal - there to add flavor and texture variety to complement the carnage. At Dong Il Jang, the selection of 'banchan' (side dishes) included: kimchi, potato salad, glass noodle salad, marinated broccoli, radish/carrot salad, and lettuce leaves with kimchi vinaigrette. We were not overly impressed by DIJ's banchan offerings - other places would offer more variety including rice wrapper sheets 'dduk bo ssam' (for rolling up pieces of meat), 'mook' (a semi-transparent jello-like cubes that are subtle in taste on their own, but topped by a spicy-salty mix of kimchee, soy sauce and sesame), and dried anchovies. My fav out of those on offer was the lettuce with kimchi vinaigrette - for the combo of fresh / crunchy with slightly spicy / tart. But the meat - the meat was amazing, simple, clean and perfectly sliced for even grilling. As I mentioned earlier, the waitresses were all in old school uniforms, and offered incredibly attentive service. Although part of the fun of Korean BBQ is the DIY aspect, and bonding with your fellow diners through working together to manage the cooking of the food - I enjoyed the full service treatment at Dong ll Jang as well. Once the grill was heated up to the right temperature, it was buttered down in preparation for the meats. Our waitress expertly placed the first batch with impressive speed and precision, along with a cross section of onion that Foodie Mentor referred to as a 'landing pad' for your meats - so that if any look to be overcooking, but none in your party are ready to consume the pieces, you can give it reprieve from the grill (but maintaining its temperature) by 'resting' it on the onion for a while. Simple but clever device! In between service, you can of course turn over the meats yourself (or if you wish, even decline service and just let them know you want to just cook all the meats for yourself) - though if you seem to be struggling, the waitress will immediately come by to help out to ensure your meal is perfectly cooked. The meats were beautiful to see and eat - and we were provided with a simple dipping sauce made of oil, salt and pepper, as well as a mountain of shredded green onions that are perfectly designed to complement the meats - providing a nice contrast of fresh, crisp/crunchy, airy and light flavor with the heavy, slightly greasy and more filling meats. And for the grand finale - after all the awesome meat flavors have spread over the grilling pan, rice, kimchi, chili-garlic paste, scallions, cucumbers and additional pieces of beef are added to the pan and pretty much stir-fried by our waitress right in front of us at our table to make the irresistibly fragrant Kimchi Fried Rice. This was possibly the best Kimchi Fried Rice I have had all year! For a party of 4, our total came out to about $35 each with tax and tip included, which is fantastic given the quality and quantity of food served. There are of course places that are much cheaper, as well as AYCE Korean BBQ places like Manna - but Dong Il Jang really stands apart from the crowd in terms of quality of its food and dining experience. You won't find the latest Korean pop / dance music being pumped through here - Dong Il Jang is all about serving quality food in a comfortable setting. 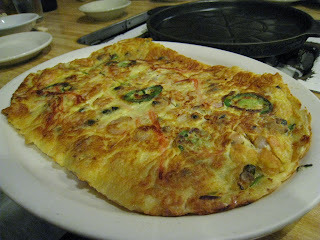 All in all, I would recommend Dong Il Jang as a foodie friendly place, or for anyone looking to have an authentic, nostalgic and relatively upscale night of korean bbq in K-town.